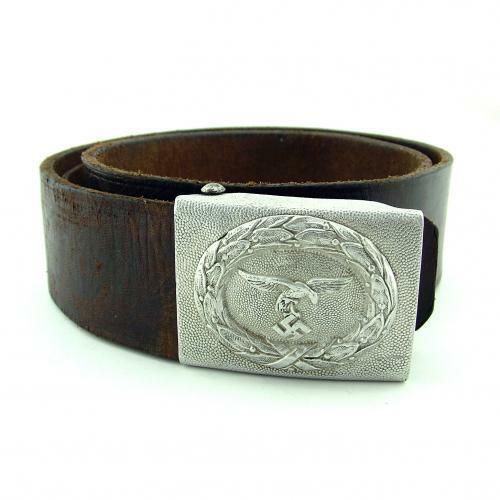 Enlisted mans / NCOs black leather belt. With early two-piece construction aluminium buckle, the central oval section held in place with fold-over alloy tabs. Luftwaffe national emblem with the first pattern 'droop tail' eagle. No obvious markings. The leather measures 90 x 4.4cm and remains in good supple and strong condition. Average wear to the chromed finish that would no doubt benefit from some black polish. The buckle shows minor wear and small dents. Good '+' used overall. Stock code U21368.